Note: If you are looking for information about how to install Tableau Server, see the Install and Configure section in the Tableau Server Help instead. This topic describes how to install and activate Tableau Desktop or Tableau Prep Builder from the user interface. For information about how to install and activate your product from the command line, see Install Tableau Desktop and Tableau Prep Builder from the Command Line. To install Tableau Desktop or Tableau Prep Builder you will need two things; a Creator product key and the installer for the version you want to install. For information about what applications are included with a Creator product key, see the Tableau Pricing page. 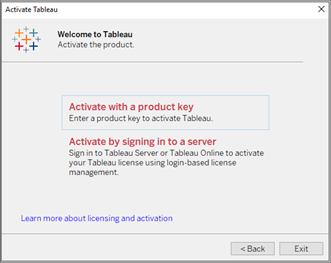 Note: If you are an existing Tableau Desktop customer, you may have a Tableau Desktop only product key (the key number starts with the letters TD). If you want to also install Tableau Prep Builder you will need a separate product key for it. Contact your Tableau Administrator or contact Tableau Support. To find out what kind of key you have, see the instructions for existing users in Where's my product key? Important: Starting with version 10.5, Tableau Desktop, Tableau Reader, and Tableau Public (desktop) only run on a 64-bit operating system. 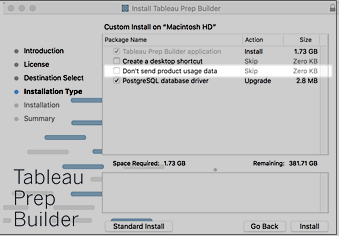 Tableau Prep Builder is only available for a 64-bit operating system. If you want to install Tableau Desktop on a 32-bit operating system, open the Product Downloads and Release Notes page and download the installer for version 10.4 or earlier and follow the install instructions in the Tableau Desktop Deployment guide for that version. For the most current version of Tableau Desktop or Tableau Prep Builder, go to the Customer Portal page. In the Product Downloads section, click the appropriate link to download the installer for your product and operating system. You can also find the installers for all products and versions on the Product Downloads and Release Notes page. Open the Product Downloads and Release Notes page and select Tableau Desktop or Tableau Prep Builder from the list on the left side of the page. Click on the version you want to install. In the Download Files section of the page, click on the installer for your operating system to download it. 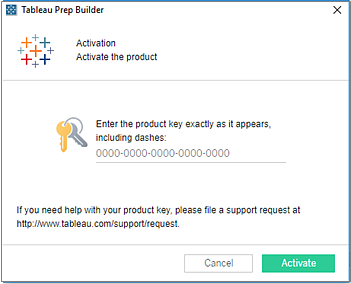 You need your product key to activate Tableau Desktop and Tableau Prep Builder after the install process is finished. You can always view your product key in the Customer Portal. Note: If you have trouble signing in to the Customer Portal page, or if you need help retrieving your product key, contact Customer Service and provide your name, company, phone number, and email address. Sign in to the Customer Portal page on the Tableau website using your email address and password. The information you need to sign into the portal for the first time is sent to you in a welcome email from Tableau after you purchase the product. At the top of the Tableau Customer Portal page, click My Keys. A table opens, listing any product keys assigned to you. Copy your product key from the Key Name column in the table. Keep this key ready and secure. Note: This example does not show any actual keys. The highlighted area shows where your key would be listed. Open your existing version of Tableau Desktop or Tableau Prep Builder. From the top menu, click Help > Manage Product Keys. Copy your product key from the Product Key column in the table. Keep this key ready and secure. If you are not able to open the Manage Product Keys dialog to see your key, log into the Customer Portal and follow the instructions for first time users above. If you don't have a product key, try the 14-day Free Trial or download the Tableau Desktop Public Edition instead. If you are a student or teacher, go to the Academic programs page to request a license and receive instructions about how to download your copy of Tableau Desktop or Tableau Prep Builder. Download the installer using the instructions in Where's the installer? For Mac, the installer is downloaded to your Downloads folder. If you're using a deployment tool that requires the Windows installer (.msi file) to install Tableau Desktop or Tableau Prep Builder, follow the instructions in Extract and run the Windows (MSI) installer to extract the .msi file from the Tableau installer .exe file. As an Administrator, log in to the computer where you are installing Tableau Desktop. For Windows: Run the installer and follow the prompts. For Mac: Open the Disk image file (.DMG) and double-click the installer package (.PKG) to start the installation. 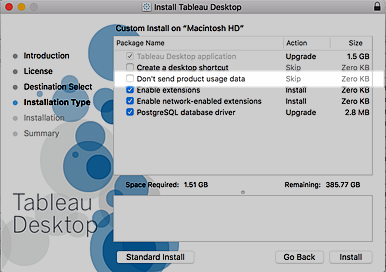 Drivers for some data sources are installed automatically when you install Tableau Desktop. See the Database drivers installed with Tableau Desktop and Tableau Prep Builder section in the Before You Install topic for specifics. To enable or disable usage reporting complete the following steps for your operating system. This option allows us to gather usage pattern data to improve the product. For more information about this option and how to turn it off after installation, see Turn off usage reporting. Select or clear the Improve this product by sharing usage data with Tableau check box. On the Mac you can also change the settings on this page to customize your install. Install location: Specify a different location to install Tableau Desktop. Important: If you specify a custom directory for the install location and plan to install future releases to this same location, you need to specify a version specific sub-folder to install to. Otherwise you will need to uninstall the previous version first. Side-by-side installs of multiple versions in the same sub-directory is not supported. Create a desktop shortcut: Clear the check box if you don't want to automatically create a desktop shortcut for Tableau. Create a Start menu shortcut: Clear the check box if you don't want to automatically add a shortcut for Tableau to the Start menu. Check for Tableau product updates: Clear the check box if you want to disable the product update feature. This feature checks for maintenance updates and installs them automatically. If you disable this option at install it also disables the menu option for users. For more information about the product update feature, see Control Product Updates for Tableau Desktop. Install database drivers: Clear the check box if you don't want to automatically install the database drivers. You can also disable one or more of the drivers from the command line. For more information about this option, see Installer properties . Click Install to begin installation. If you run into any difficulties, see Troubleshoot Your Tableau Desktop or Tableau Prep Builder Installation. After installation is complete, you will need to activate and register the product to begin using it. For more information, see Activate and register your product. Important: Tableau Prep Builder is designed to work with Tableau Desktop. It is recommended that you install Tableau Prep Builder on the same machine as Tableau Desktop. Do not install Tableau Prep Builder on the same computer running Tableau Server. Server Resource Manager (SRM) can't distinguish between Tableau Server protocol server process and Tableau Prep Builder protocol server process. If the computer resources are exhausted SRM may terminate the protocol server process belonging to Tableau Prep Builder, which has no recovery mechanism. As an Administrator, log in to the computer where you are installing Tableau Prep Builder. For Mac: Open the Disk image file (.DMG), and then double-click the installer package (.PKG) to start the installation. When prompted, accept the licensing agreement to continue the installation. Install location (Windows only): Specify a different location to install Tableau Prep Builder. Create a desktop shortcut: On Windows, clear the check box if you don't want to automatically create a desktop shortcut for Tableau Prep Builder. On Mac, select the check box to automatically create a desktop shortcut for Tableau Prep Builder. Enable error reporting (Windows only): If Tableau Prep Builder has a problem and shuts down unexpectedly, crash dump files and logs are generated and placed in your My Tableau Prep Builder Repository > Logs and My Tableau Prep Builder Repository > Logs > crashdumps files. To turn off this option during install, clear this check box during install. To turn this option off after installation see Turn off error reporting. Install database drivers: Clear the check box (Windows) or check boxes (Mac) if you don't want to automatically install the database drivers. Click Install to begin the product installation. Important: The Tableau licensing service was moved to a new data center on October 6, 2018. This means that any environments that required special configuration (static IP safe listing for example) to access licensing.tableau.com or licensing.tableausoftware.com will need to be updated. For more information, see Tableau Community. After the installation process is finished, the next step is to register and activate your product. To activate the product you will need the product key that you saved earlier. If the computer where you're installing the product has internet access, the installation process walks you through activating the product. If you're installing the product on a computer that doesn't have internet access, or if your company firewall or proxy restricts access to the licensing.tableau.com site, you must complete some additional steps to activate the product offline. To activate Tableau Prep Builder offline you must use Tableau Desktop. If you're upgrading versions and you've paid your maintenance (Tableau Desktop only) since the last time offline activation was completed, contact Tableau Customer Service via email to get an updated product key before continuing with the procedure below. For more information about offline activation, see Activate your product offline. For information about activating and registering your product from the command line see Activate Tableau Desktop and Tableau Prep Builder and Register Tableau Desktop and Tableau Prep Builder. After the installation process is finished, open Tableau Desktop. This launches the Tableau Registration form where you can register and activate your product. Fill out the fields on the registration form and then click Activate Tableau. Delete any existing text in the Enter product key field, copy your product key (from the location that you saved it to from the Where's my product key? procedure) and paste it into the text box, then click Activate. A second screen appears to complete the activation process. Click Continue to finish the process. 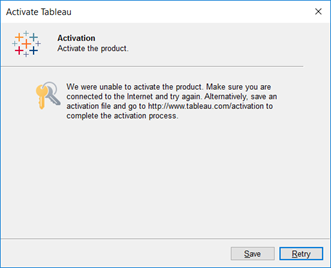 If Tableau can't connect to the site that authenticates that product key, it can't complete the activation and you must activate the product offline. Follow the instructions in Activate your product offline to complete the activation process. Click Activate Tableau Prep Builder. Enter your product key and click Activate. Complete the registration form, and then click Register. When your registration is complete, Tableau Prep Builder opens and you can start preparing your data. New to Tableau Prep Builder? Try the Get Started tutorial to learn how to build your first flow. If you're installing the product on a computer that doesn't have internet access, or if your company firewall or proxy restricts access to the licensing.tableau.com site, then you must complete the steps below to finish activating your product. You will need access to another computer that has internet access to complete all the steps in this procedure. To activate Tableau Prep Builder offline, you will need your product key and Tableau Desktop version 2018.1 or later installed on the same computer that is offline. 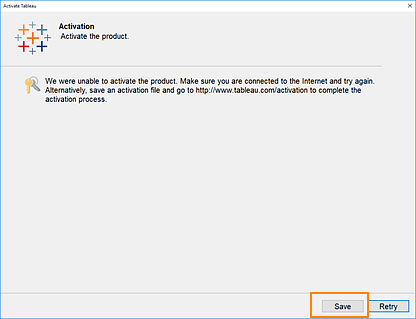 In the Activate Tableau dialog, click Activate. Tableau prompts you to save a file that you can use for offline activation. Click Save. Note: If you're performing the offline activation process because of firewall or proxy restrictions, you might not be prompted to save the activation file. In that case, manually disconnect the computer from the network and then restart this procedure so that you can be prompted to save the activation file. Save the file to a location that you can reach from a computer that does have internet access. Use the default file name (offline.tlq). From a computer that has internet access, open a web browser and go to the Activation page on the Tableau website. Complete the instructions for Offline Activation to submit your offline.tlq file and create a activation.tlf file. Save the activation.tlf file and then copy it to the computer where you installed Tableau Desktop. On the offline computer, double-click the activation.tlf file to perform the offline activation. From the top menu, select Help > Manage Product Keys. In the Manage Product Keys dialog, click Activate. 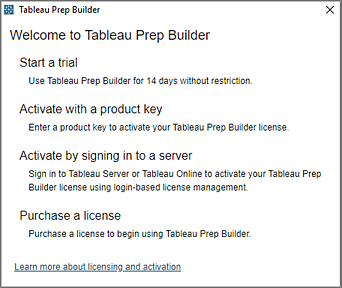 Enter your Tableau Prep Builder product key and then click Activate. Tableau Desktop detects that you are offline and shows the following message. Click Save to create an activation file. Save the file to a location that you can access from the offline computer. Use the default file name (offline.tlq). Follow the instructions and select the (offline.tlq) file that you just created and upload it to create a create a activation.tlf file. You will need this file to activate Tableau Prep Builder. Click Upload Activation File. You should receive a confirmation dialog that the upload was successful. In the confirmation dialog click the link to download the activation file to complete the activation process. Launch Tableau Prep Builder. You will be prompted to complete the registration process form to register the product. If you have previously registered a Tableau product, the fields may be populated automatically. During installation, Tableau configures default settings for your display language and repository location. If you want to change those settings you can do this after install is complete. Tableau also enables certain features for you by default such as usage reporting or automated product updates (Tableau Desktop only). For information about how to turn off these features and more, see Change Installation Settings after Installation. When you first run Tableau Desktop or Tableau Prep Builder, it recognizes your computer locale using the User Locale setting and uses the appropriate language if it is supported. If you are using an unsupported language, the application defaults to English. You can configure Tableau Desktop or Tableau Prep Builder to display the user interface (menus, messages, etc.) in a different language by selecting Help > Choose Language from the top menu. Restart the application to apply the change. For Tableau Prep Builder, the display format for numbers and dates is based on the locale of the operating system on the machine where the application is installed. For Tableau Desktop you can configure date and number formatting for your workbooks. For more information see Language and Locale in the Tableau User help. During install, Tableau Desktop and Tableau Prep Builder automatically creates a My Tableau <application> Repository folder structure in your documents folder on your computer. If you need to move this repository to another location, for example because you are required to have your data on a network server instead of on your local machine, you can specify a new location and point Tableau Desktop or Tableau Prep Builder to the new folder. The new folder must be a directory. You must have permissions to write to the new folder. The new folder can't be located in the existing My Tableau Repository folder structure. Note: Changing the repository location does not move the files contained in the original repository. Instead, Tableau creates a new repository where you can store your files. Open Tableau Desktop or Tableau Prep Builder. From the top menu, select File >Repository Location. In the Select Repository Folder dialog, select a new folder that will act as the new repository location. Restart the application to use the new repository.